As I get older, I tend to get nostalgic on special days like Valentine’s Day, which is coming Thursday. I will still devour that gifted box of classic chocolates, but I tend to enjoy the thoughtful and reminiscent gifts all the more. I love to give wine, especially with notes of why one was chosen. Wine has been a thread through my marriage for years, with many funny stories of wine hunts together and memories of special bottles shared. As you ponder what wine to share this Valentine’s Day, consider these ideas. Hark Back to Days of Old: I remember the wine we shared when my husband proposed. A Duckhorn Merlot. We had completed the Los Angeles Marathon the day before, watched Utah in the finals of college basketball just prior, and were enjoying a dinner much fancier than our pocketbooks in celebration. I will always remember how electric we felt with such phenomenal wine, food, and each other. I’ve since followed Duckhorn religiously and celebrated Wine Spectator’s choice of the Duckhorn Three Palms 2014 as their 2017 wine of the year. Clearly, my husband has great taste! He is still a merlot fan, and Valentine’s Day would be a fun day to pour Duckhorn’s newest 2016s to market or one with a bit more age like the 2015 Atlas Peak or splurge for a 2015 Three Palms. Make the Night Sparkle: Though our wine tastes have diverged over the years, we’ll always share a bottle of bubbly together. My husband has become a mainly a red wine drinker, while I openly accept and consume nearly all varietals. The plus side is I never have to share my whites or rose. Valentine’s Day is a great time to splurge a bit on your bubbles and buy that special bottle of Dom Perignon you’ve been eyeing at Costco. Or smarter still, go venture into an Orange County wine specialty shop like Wine Exchange or Hi-Time and give them your price range. You also can purchase spectacular grower Champagne that’ll have you forever refusing to drink the grocery store sparkling. I just searched on Winex.com for Champagne for $50 and lower and quickly found 25 quality bottles. The Nicolas Feuillatte Brut Reserve is on sale for $29 and the Wine Spectator 92-point Drappier Brut Champagne Carte d’Or is just $37. Champagne is such a special experience that it is worth a small amount of legwork to purchase a bottle that brightens the occasion but doesn’t drain your wallet. 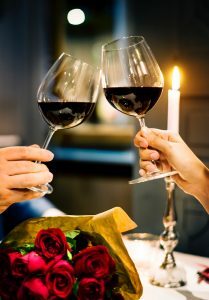 Pair the New with the Old: My husband and I have such fun wine memories because we like to drink outside of our palate and try new labels and varietals. I love to learn of a restaurant’s staff’s personal wine picks and recommendations. Enjoy something new by the glass, such as an Italian red blend. Though the label or varietal may be unheard of or weird, go for what the restaurant team is swooning over. If you dig it, get another pour or try their next favorite pick. If you don’t enjoy it, you can still order that trusty bottle to share. One of my favorite wine experimentation spots is Pizza Ortica in Costa Mesa. The wine choices are unique, expansive, and staff members are psyched to share what they love.